1.An academician not lower in rank than that of a Associate Professor in the University or in the affiliated Colleges with 15 years of teaching experience. 2. Knowledge of Tamil to the extent of carrying official correspondence and drafting reports. 3. Five years of administrative experience is desirable. 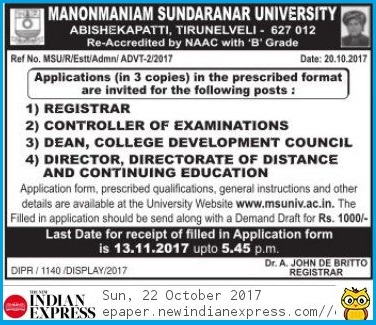 2) The filed in application should be accompanied with a Demand Draft for Rs.1000/­ towards the application fee, drawn in favour of the Registrar, Manonmaniam Sundaranar University and payable at Tirunelveli. Money order / Postal order / Cheque / Cash will not be accepted. 4) Separate application should be sent for each post in a separate cover along with Demand Draft. 5) Applicants should be prepared to come for an interview to be held at Abishekapatti, Tirunelveli 627 012 at their own cost. 6) Applicants for the post are required to submit their applications in the prescribed form in three copies, containing full particulars as age, qualifications, experience, community. degree(s) taken with marks or grade(s), etc. In the application, the number or years of previous teaching experience as Reader / Associate Professor at undergraduate and postgraduate level (Certificate must be produced) and other academic distinctions, publications (one set to be sent which will not be returned), present occupation, salary (basic pay and other allowances), Languages with which the applicant is conversant, must be mentioned. 7) Applicants in service should send their applications through proper channel along with a 'No Objection Certificate' obtained from their employer concerned. Pay certificate obtained from the employer should be sent by those who are presently employed, along with application or should be brought at the time of interview, without fail. 8) Applicants who attempt to canvass or bring influence in any manner shall be disqualified. 9) Selected candidates shall be required to join duty immediately and enter into an agreement, with the University in accordance with the laws of the University. 10) The University reserves the right to accept or reject any application. 11) Service rules are as per the rules of Government of Tamil Nadu / University. 12) Candidates should invariably fill in the information regarding court cases pending, criminal cases, disciplinary actions or equivalent etc. in the relevant column of the application form. Any changes in this information as and when occurred after the submission of application form till the completion of recruitment process should be brought to the notice of the University by the candidate, failing which the University reserves the right to cancel the candidature and to debar him/her from all selections. 13) The University reserves the right to fill or not to fill up the post without assigning any reason whatsoever.